Not all insulation machines are created equal. This article is a complementary article to: What Sets Cool Machines Apart from the Competitors. I am NOT about making negative statements regarding other competitors. I believe that highlighting the negatives of other insulation machine manufacturers serves no good purpose. Besides, why should you believe me? Let me highlight the POSITIVE strengths of our machines. Industrial-grade Steel: While the weight of a machine is always a consideration, especially for portable units, we do not sacrifice the quality of build for weight. The Cool Machine brand has struck an excellent balance between strength and weight in its design. Cool Machines uses industrial grade steel, not light gauge steel. The hopper and airlock take constant abuse. The steel we use handles the wear and tear of a variety of insulation products. Unfortunately, the internet does not give you the ability to handle a machine side-by-side. So, the best way to describe our machine is to contrast the lightweight 2012 toolbox to one made in 1940. 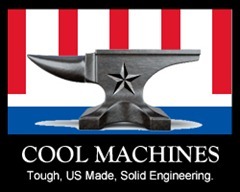 With decades of industrial machine engineering experience, Cool Machines will provide you with a long-lasting machine. It may be the last machine you ever need. Powder-coated: The hopper, base, airlock, protective shields, moving parts, and all structural steel is powder coated. Cellulose is corrosive when wet/damp. Powder coating provides a harder more durable surface protection than a sprayed on epoxy. Besides, powder is safe for the environment. Add to that: our machines look very nice for a long time. Nickel Plated Corrosion Resistant Roller Chain: A reliable chain is key. The scalping auger is chain driven. The environment that these chains work in is rugged. Corrosion is a chain’s worst enemy. The nickel plating protects the chain from the elements. The agitator motors are farm-grade components. They are designed to work in the harshest, extreme environments. Agricultural-grade components double the typical service life of motors in its class. A farm duty motor has better endurance in harsh outside environments and has a higher torque rating for frequent starts and stops under a load. Weather and extended use can create a build-up of damaging heat[1. Also the use of light gauge, long electrical supply will degrade the life of a blower.]. The electrical components of the Cool Machine are protected by redundant circuitry protections. Circuit Panel: Power trips are inevitable and unintentional. What is intentional is having a machine with easy-to-find circuit breakers. These fuses prevent damaging power surges to the internal circuitry. These breakers are within clear view of the operator so minimal time is wasted on the job-site. Redundant Overload Circuit: In the event that a power surge pushes past the circuit panel, the agitator motor has an embedded breaker of its own.